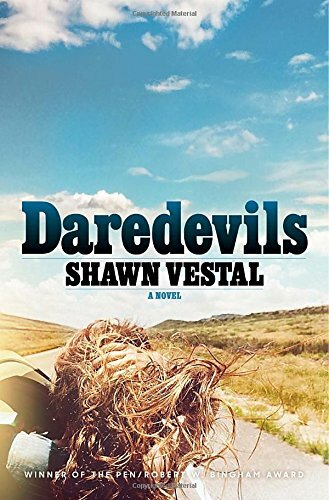 "A Spectacular, Vulgar American God"
A Mormon community in '70's rural Idaho may not sound like obvious environment for riveting fiction – but that's just what Daredevils, Shawn Vestal's propulsive debut novel, is: a thrill ride befitting the book's iconic superstar, Evel Knievel, who makes cameo appearances throughout. Throw in some teen angst, young love/lust, polygamy, a soundtrack that includes the Stones and Led Zeppelin, and Vestal has produced a page turner that never takes its foot off the gas. The main characters are conflicted and flawed. Loretta is a teenage daydream both for the high school boys her own age, her secret boyfriend, a decade older, and Dean, the thirty-something already married man her Mormon parents force her to wed. Dean's religious piety makes an odd bedfellow to his shady lifestyle and James, Dean's pent up teenage nephew and Evel Knievel fan, has raging hormones that get a jolt every time Loretta is near. Amazon Book Review: It's fascinating that Evel Knievel makes cameo appearances in a novel about repressed Mormon teens, and somehow it all works. What made you decide to include him, or I should say a fictionalized version of him? Shawn Vestal: I have always been interested in him, and I am drawn toward the notion of using him symbolically or metaphorically – as a kind of spectacular, vulgar American god, or an untrustworthy Greek chorus. I was 8 years old when he tried to jump the Snake River Canyon in 1974, about 30 miles from my home, and I wasn't able to go and watch the jump though I badly wanted to. That probably has something to do with it…. ABR: You take quite an artistic license with his persona. SV: I did take great license, and tried to enlarge and manipulate the ways in which Evel Knievel is such a potent American character – one in whom a writer can invest a great amount of metaphorical weight and meaning. There is a decent amount of characterization in the novel that is true to the record of who Evel Knievel was, but there are also many liberties that I took and scenes I imagined. I have written many short stories over the years with this fictionalized Evel, stories that never really added up to anything. At some point late in the drafting of the novel, I began to write these dramatic monologues drawing upon this reservoir of work, with Evel speaking in the royal "we," and the passages were so preposterous and dirty and fun to write – and they brought an entirely different voice into the novel – that it just felt natural to keep going. As a reader, I like the kind of fiction that partakes of the world of facts in unpredictable or strange ways, enlisting facts into the service of art – building the lie that aims for the truth. (I don't much like the reverse of this – fictionalizing in the guise of nonfiction.) DeLillo's Libra is one of my favorite examples of this, but lately I've been reading a lot of Shakespeare and it's fascinating the degree to which this was his model hundreds of years ago: rewriting and dramatizing real lives or other people's stories. Talk about license – he took liberties with the stories of scores of real people, from Julius Caesar to Cleopatra to all those kings of England. ABR: I see that you and Jess Walter are friends and have put Spokane, Washington on the literary map. Is there a literary scene there? How did you end up there? SV: We have a thriving, friendly, supportive literary scene here. Jess is pretty much the mayor of that village and deserves credit for helping it grow simply because he stayed here and made it his home and set an example for so many others, but there are a lot of great writers. There's a strong MFA program (which I attended and now teach in occasionally) at Eastern Washington University, and great independent book store (Auntie's) and people are always organizing fun literary events, and every time you turn around someone else has published a great book, and it feels like a special, fortunate time to be doing this work in this place. I came here at the end of 1999 to work at The Spokesman-Review, and have come to love the town. My writer friends are a big reason for that. Subscribe to Omnivoracious: The Amazon Book Review, featuring picks for the best books of the month, author interviews, reading recommendations, and more from the Amazon Books editors.